For the Verizon version of the firmware, you have two versions of the radio firmware. I assumed it was the one with “CDMA” in the filename, but I was wrong and it rendered my phone unable to connect to anything. Luckily a re-flash with the other fixed the problem, but I am curious what that first file is for? So glad you wrote this because I could not figure out why my phone was no longer connecting to Verizon. Seems weird that the CDMA radio image is not the correct one. I ran into the same problem. I flashed the cdma radio and my phone refused to find service. Once I re-flashed with the other available radio everything was fine. What do I have to do to get the new update for my nexus. I am currently running the codename android rom and it was my first time unlocking a phone and installing a rom. (thanks for the help with that btw) Also is it worth it to get the new os update or just keep what i have. Help Me MAX! If you’re asking about the Jelly Bean update for Verizon, then all you need to do is everything stated above in the post (just follow along with the video), then go to Settings > About Phone > System Updates and check for new updates (it may take a few tries). Make sure though that when you go through the process Max gives above, you don’t flash the radio with the CDMA firmware (it’s the file that contains CDMA in the name). This will render your phone unable to connect. It’s fixable (just flash it again with the right file), so if you flash the wrong radio it’s okay, just know that that’s why. You will also need to lock the phone again (as demonstrated above). As for whether or not it’s worth it, it depends on what version you currently have and if you like it. Jelly Bean is pretty awesome, with Google Now and the Project Butter enhancements. Those are really the only two things I’ve noticed to be huge improvements, but there are a lot of other smaller things that are cool, too. But everyone is saying not to flash the radio that has cdma in it… but thats the only one that has I515.FC04. What do I do? Verizon is CDMA device, so you should be good, just not for GSM phones. Just had this problem, pretty much you need to flash both radios by passing in different arguments, below are examples. Cant u upload the 4.1.2 stock firmware? Can i flash that using my CWM recovery like any normal custom rom and keep my root? I unrooted but did not re lock the bootloader. When my phone came back up, my pics were gone. Can I still recover them with Titanium backup Pro maybe? my device is installed but doesnt show in device manager and when im up to cmd and flashing the bootloader it says waiting for device? could it have to do with when i plug my phone into my computer and it comes up as a media player? i dont know but please HELPP!!! 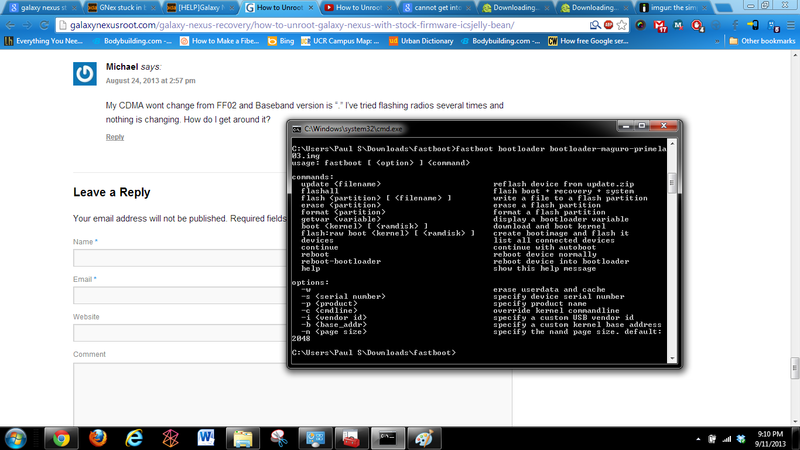 Max, can we substitute these commands with command: ./flash-all.sh ?? What do i do if i lost my baseband? When I go to flash the bootloader thru command prompt It says waiting for device but nothing happens. Any suggestions? Is the Sprint file available yet? I followed everything exactly as mentioned above, but for some reason my mobile network doesn’t have any signal. Know what could have happened? I have tried removing sim card & battery for up to 5 minutes, but no change. Please help. I have followed the steps above, and they work, for a day or two. It seems after flashing the recovery, I am able to boot into clockwork. But after a day or two I go to try and boot clockwork and it shows the stock background with no options after selecting recovery mode. Any thoughts? Hi there, I have a GSM Galaxy Nexus but my device is apparently running yakju at Maguro 4.2.2. So I’m not sure if I can use the takju version that he is using in this video?? My CDMA wont change from FF02 and Baseband version is “.” I’ve tried flashing radios several times and nothing is changing. How do I get around it? Hey Max! I know my chances of getting a reply here are slim to none and you’re an extremely busy guy! Long story short, messed up my gnex and it won’t boot up. I can get into fastboot but can’t get into recovery (I get that damn red exclamation mark!). I have tried the adb commands to flash the stock image back to my gnex but it throws me this error (actually I don’t even think it’s an error. No idea) http://i.imgur.com/PV204Sz.png . I have no idea how to fix this. I have been scouring the forums online and have made baby steps but am stuck at the damn error. I’m trying to just get everything back to stock so I can give my phone to my gf. If you or anyone else in this thread can help me out I would be so appreciative!! Nvm Max! I dug deeper and found out this morning I was forgetting the actual “flash” command :P. No wonder it didn’t know what I was asking it to do. Anywho, you’re a saint and I love your videos! You’re my go to for all things android. Keep up the good work bro.